Begin with a glass of wine or cold local brew, pick a kooky apron and greet your guests. 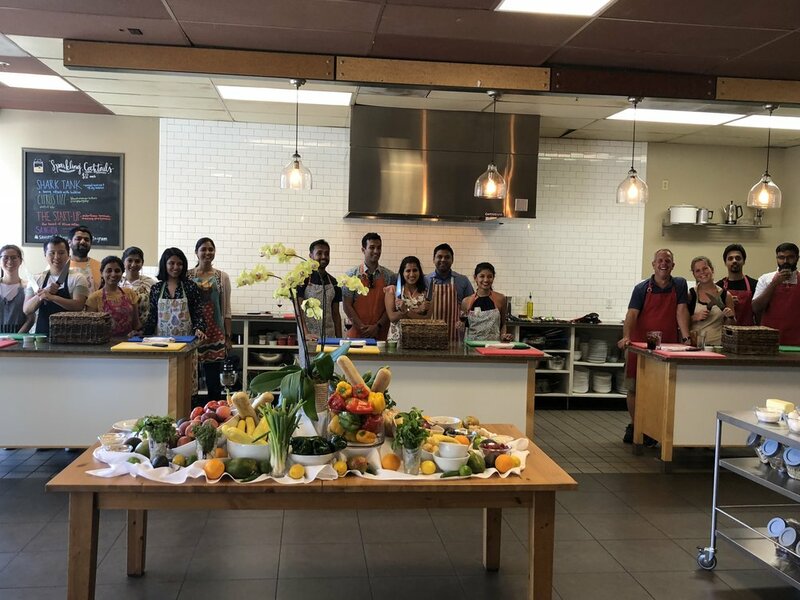 Once everyone has arrived we’ll take the group through some guidelines and start cooking, whether you opted for a traditional format where guests are honing knife skills and learning to flip crepes or teams are competing “chopped” style everyone will feel at home. Your special event is fully customized to fit your expectations. Feel free to decorate the space with extra touches to celebrate a birthday or anniversary. Flowers and linens will be provided. Step 1: Reach out to us via our Event Request Form HERE. We’ll get back to you with an estimate for your event and the forms to secure your date. Step 2: Fill out the Event Booking Form (sent over with your estimate) and wait for our confirmation. You’re now booked and ready to go! Step 3: Gather your groups dietary restrictions and select your menu. We’ll need this info along with your final headcount 1 week before your event. Don’t worry- we’ll reach out to you when we need it. Step 4: Show up, pick a fun apron and enjoy! Our menus are created with a seasonal, local focus in mind. We work with Greenleaf a local produce company to provide high quality seasonal produce, cheeses and specialty ingredients. Menus change quarterly and are always a suggestion of the freshest dishes of the season. If you have specific guests with dietary restrictions (vegan, gluten free, vegetarian, pescatarian, etc) please let us know. We always are able to accommodate all needs with modifications to those folks dishes. If you have a specific idea for a dish or entree tell us! We’ll be happy to work together to try to make all your needs met. Many groups pick dishes not listed on our seasonal suggested menu, if you aren’t “digging” any of the entrees, give us your feedback during menu selection and we’ll send over some other options that would work.